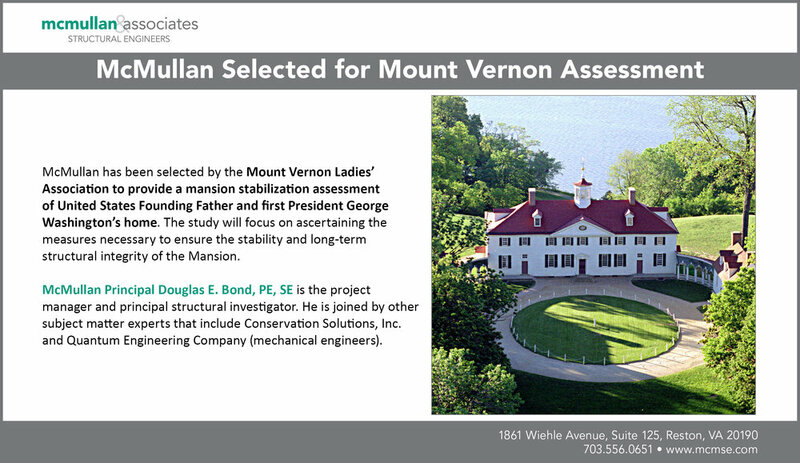 McMullan has been selected by the Mount Vernon Ladies’ Association to provide a mansion stabilization assessment of United States Founding Father and first President George Washington’s home. The study will focus on ascertaining the measures necessary to ensure the stability and long-term structural integrity of the Mansion. McMullan Principal Douglas E. Bond, PE, SE is the project manager and principal structural investigator. He is joined by other subject matter experts that include Conservation Solutions, Inc.
and Quantum Engineering Company (mechanical engineers).